When things aren’t fine internally, it disrupts your functioning especially conditions like indigestion, bloating, constipation etc. Practice these aasana to improve the functioning of your digestive system, help cleans the system and prevent gas or bloating. An aasana that is difficult to master, this one requires you to balance your body weight on your arms as well as torso. When you do this, blood supply to your digestive system is cut off for that moment, and when the pose is released, fresh blood rich in oxygen flows to the system. This improves their function and prevents any abnormalities. If you have slow digestion and often don’t feel like eating, it could probably be due to trapped wind in the system. In this aasana, you lie down and bring one knee towards the body at a time, ensuring that you exhale when the knee is drawn towards the chest and inhale as they flow away. 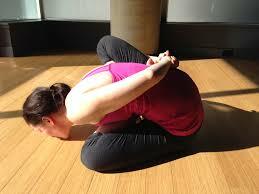 This aasana stretches the abdomen and upper body, relaxes breathing, a pose that can be practiced after dinner. Sit down with legs folded below the hips and palms on the knees. Ensure your spine is straight and take deep breaths for about 10 minutes. Stretches the spine and stomach muscles, improving the digestion process. Fold you left leg such that the ankle lies next to the hip and raise your right leg and place it on top of the left such that both the knees touch. Now, stretch your hands behind such the right and left hold each other. With an erect spine, take deep breaths for a minute and then alternate position. These work on your abdominal muscles to improve digestion and can be practiced while sitting or even lying down. Just ensure your spine is erect and gently twist the body taking support of the hands and legs. This make look easy but is in-fact quite difficult to master. This bend stretches the spine and improves digestion by opening up the system. It stimulates the digestive system and helps get rid of toxins which prevents indigestion, constipation etc. It involves performing abdominal exercises that focus on the muscles the that are.